What Is the Cricket Rule for Run Out & Cross Over? 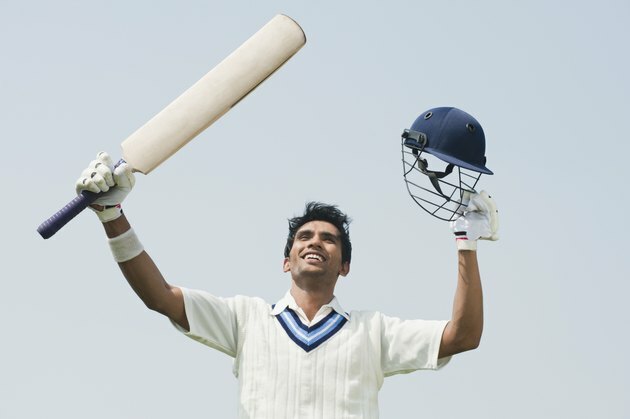 Even if cricket is your cup of tea, you may have a hard time following the in's and out's of the game. Especially the "out's." The Laws of Cricket are constantly being revised and upgraded and if someone isn't up-to-date, confusion on the lower levels of the game can occur. However, when you're out, you're out and here's an explanation why. Umpires can give cricket batsmen an out for a number of reasons. One involves a "run out." This usually occurs when a fielder hits the bales with the ball while the batsman is running to his safe zone, known as the crease. While running, the two on-field batsmen cross over. Run outs tend to happen near the end of games when a team is chasing a score or during one-day matches in which fast scoring wins matches. A batting team scores by accumulating runs. Each run represents one switch between the two batsman on the pitch running to their opposite crease. When the batsman leaves his crease to attempt a run, he's out of his safe zone. During that period, if a ball hits the stumps and takes off the wooden bales, then the batsman closest to that end is given an out. When batsmen run, they usually keep the bat held out in front of them. This is because a batsman needs to have some part of his body or bat touching the ground in the crease to be judged safe. If a batsman wanders out of his crease while the ball is in play, he can be run out without even trying to score a run. Batsmen cross over while running to their opposite creases. If a wicket falls before the batsmen cross, then the batsman running away from that crease is given an out. If the two have crossed and a wicket falls, then the batsman running toward that crease is out. In short, the closest batsman to the fallen wicket is given an out for run out no matter when or if the batsmen cross over on the pitch. The run out rule has several exceptions in which the batsman is safe despite the wicket falling. For example, if a batsman stands in his crease but has to duck or jump out of the way to avoid being hurt by a moving cricket ball or player, then she can't be given an out. Similarly, if the ball rebounds off a player's helmet and directly onto the stumps while the player is out of the crease, it's not deemed an out. Like many decisions in cricket, the difference between in and out may only be by a few millimeters. During international cricket games umpires frequently refer run out decisions to the third umpire. The third umpire can review slow motion footage from different angles and make a more accurate decision. In particular, the third umpire may look for signs of dust being thrown up as the bat hits the ground.